"At the general high level debate, out state will be represented by a delegation headed by Ukrainian President Petro Poroshenko, who will speak in the General Assembly hall on September 29 and hold a number of bilateral and multilateral meetings during his stay in New York. 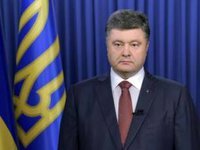 The Ukrainian President will represent the country at the most important events of the 70th session of UN general Assembly's opening with the participation of world leaders," reads the statement on the Facebook account of Ukraine's permanent representatives to the UN. According to the statement, the key elements of the Ukrainian delegation's work in 2015 will be the election of Ukraine as a nonentity member of the Security Council for 2016-2017.